The ‘690 patent describes a method for acquiring bio-information of players during a game to assist in selection of teams during an online game. Once the information is collected, the invention attempts to group players with similar bio information onto the same teams. It also makes the teams as evenly as possible to make the game more enjoyable for all of the players involved. The present invention is directed to a game apparatus adapted for executing game performed by plural teams, and is adapted to acquire bio-information of players of the game by biosensors (31), (32), . . . (3n) to allow bio-information to be associated with players of the game. 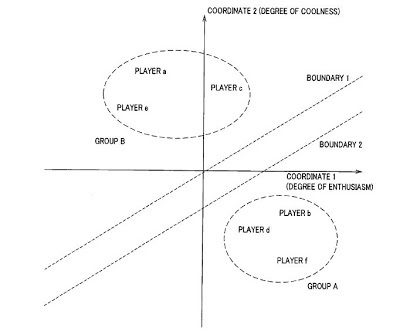 In a control unit (10), bio-information caused to be associated with respective players are analyzed to judge, by the analysis result thus obtained, teams to which respective players belong. The judged team classification result is notified to the players to thereby eliminate troublesomeness of operation such as team designation by players, thus permitting the players to sufficiently enjoy amusement of the fighting game. 1. A game apparatus comprising: bio-information acquisition means for acquiring plural kinds of bio-information of players of game; bio-information analysis means for selecting a first subset of a plurality of different kinds of said plural kinds of bio-information commonly representing a first characteristic among said plural kinds of bio-information to generate a first coordinate representing a first characteristic, and selecting a second subset of a plurality of different kinds of said plural kinds of bio-information commonly representing a second characteristic among said plural kinds of bio-information to generate a second coordinate representing a second characteristic, and arranging said first coordinate and said second coordinate in a two-dimensional space, where a first dimension of said two-dimensional bio-information space corresponds to said first characteristic and a second dimension of said two-dimensional bio-information space corresponds to said second characteristic; and team judgment means for judging teams to which the players belong in accordance with a position in said bio-information space of the bio-information arranged at the bio-information analysis means.